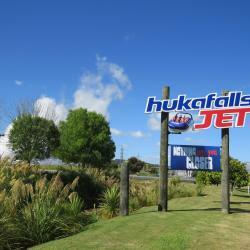 Looking for hotels near Huka Falls? Surrounded by 17 acres of countryside on the banks of the Waikato River, the Huka Lodge features an outdoor swimming pool, a tennis court, free airport transportation and a hot tub. Boasting free Wi-Fi and free breakfast, B&B @ Number Ten is 10 minutes’ walk from Taupo's hot spring thermal swimming pools. No. 6 Heathcote is located just 2297 feet from Taupo's town center and a short stroll from shops, cafes and restaurants. It is 15 mi from Orakei Korako - The Hidden Valley. Located across the road from Taupo’s main beach, Gables Lakefront Motel offers stunning lakefront views, free Wi-Fi and a family spa pool. Some apartments boast their own private spa pool. 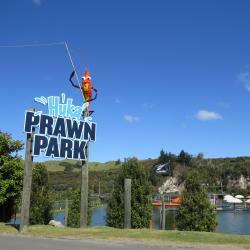 Lakeland Resort is located on the beautiful shores of Lake Taupo. Set on 2.8 acres of landscaped grounds, this resort features a tennis court, an on-site restaurant, 2 private indoor spa pools, and a... close to the lake, easy check in, restaurant had great meals. 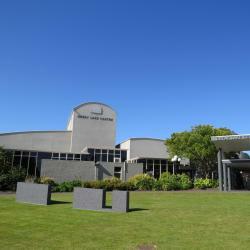 Suncourt Hotel & Conference Center offers spectacular views of Lake Taupo and the volcanoes of Tongariro National Park. Arrived very late at night after driving non stop from Christchurch. This Millennium Hotel and Resort is located right on the edge of Lake Taupo. It offers luxury accommodations and facilities that include a heated pool, sauna, gym and tennis court. Friendly reception staff. The heated pool was beautiful. Excellent. There is a bus from town to Huka falls twice a day at 940am and 215pm. NZD 2 single journey, NZD 3 for return journey. Anyway the 1 hour walking track through thermal park and along Waikato River is splendid as well. You can drive out to the falls if you're pressed for time, but I would seriously suggest the short hike out there if you can. 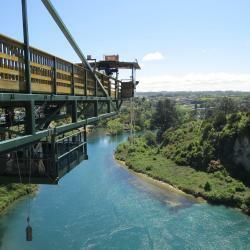 It starts right at the Taupo Bungy and follows the river all the way up to the falls. As someone who has traveled all up and down New Zealand, I have to say it is still one of my favorite scenic hikes. It does have a few steep sections, but I'd say it's easy or moderate difficulty in average and takes about an hour or so to complete. Also, there's a free, natural spring under a bridge right at the beginning of the trail, so make a note of this before spending money at places like DeBretts or AC Baths. The only downside is that it can get crowded, depending on what time you go. People are talking about Huka Falls! Explore guest hotel reviews featuring "Huka Falls"
The place is right in front of lake taupo, but the rooms have no view of it except for a partial view of the lake from the balcony. The rooms are nice. Well kept and clean. We had dinner at Mole, per recommendation of the owners. It was fantastic. It’s just around the corner from the executive motel. Loved the fresh milk and chocolate mint details. The owners were very kind and Macho, their dog, was the cutest! Taupo is small. The hot springs are incredible and Huka Falls breathtaking. Located 5min drive along water front to centre of town. Two story apartment with a private spar room, balcony overlooking the lake. End of April was the end of the holiday season but the weather was mild and sunny. Not too crowded. Short drive to the Huka Falls and Jet boat ride. Must do. Fully furnished. Clean, neat and conducive environment. Comfortable beds and well equipped kitchen. Friendly proprietor. 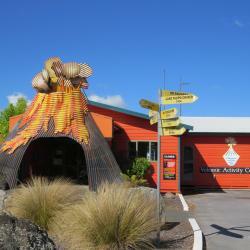 Location very near to Taupo and Huka Falls. Comfortable unit, nice view, modern furnishings. Quality bedding and good bed. Internet fine. Huka Falls just up the road. A must see. Nice cheap place to stay for a short period of time. Close to the base of the Huka falls walk and thermal pools. Close to thermal pools and Huka falls etc.